Lincoln is at pains to be historically accurate, not just in costume and décor, but in the difficult passage of the thirteenth through the House of Representatives. It also admits that its own hero was wily, devious, exhausted and untiring. The credits admit to use of Doris Kearns Goodwin’s book, Team of Rivals, not just as a way of claiming bona fides, but in suggesting that the words used—circumlocutory, decorous but pungent, and far more elusive than most movie dialogue—come from documents and memoirs. The film strives for authenticity, and it’s easy to think that Day-Lewis looks like Lincoln. But that’s not quite so; it’s not so at all. Day-Lewis is an actor (and Lincoln was not ashamed of that trade); he is a transcendent imaginative construct that may even lift this film to the level of fascination for some of our children. He is a strange, uneasy man, an altruist and a dodger from moment to moment, and someone you cannot take your eyes off. So, yes, Day-Lewis has tried to resemble Lincoln, or to keep faith with the verisimilitude in the look of the film. But he feels like a character and an actor aiming at glory and history. He is playing Steven as much as Lincoln, and that’s the great virtue of the film. For Steven is saying, look and listen: this all happened a long time ago, but it is vital and for a few days in November 2012 it is that thing we have always hoped a movie could be, a couple of hours of passing time in an attempt to speak to everyone. It is like a movie from 1939, and it has certainly studied and absorbed one film from that year: Young Mr Lincoln, directed by John Ford, and starring Henry Fonda. In the winter of 1865, Lincoln had his fifty-sixth birthday (February 12). That is how old Tom Hanks is now, and it is only a year older than Daniel Day-Lewis. Of course, we know the late photographs of Lincoln and the feeling that the man was older than years. There are pictures of Day-Lewis from the Lincoln premiere in which he seems far younger, fitter, or less exhausted than Lincoln. Day-Lewis has been made up with great skill; there is even the blemish or cyst on the right side of the mouth that we can see in photographs. Yet he cannot help but have the eyes of an actor: eager, clever, ambitious, hopeful. There’s no harm in that, for it plays along with the film’s scheme that A. Lincoln was a public act, a role, and a consummate politician who longed to be the subject of wistful stories like those he tells to dissipate tension. In the eyes of the Lincoln photographs there is something else, a calm certainty that the job is killing him. You can see the same eyes in the FDR at Yalta in early 1945. It is a look that knows there will be no need for assassination. There is a line in the film where Lincoln is told he has aged a decade in one year. He grins wryly, just as he abides by his wife, as played by Sally Field. Mary Todd Lincoln was 49 in 1865, but Field is now 66 and quite possibly on her way to a third Oscar. (In another time, she won for Norma Rae and Places in the Heart). In photographs, Mrs. Lincoln looks drab and depressed, while her husband seems austere and melancholy—there’s a world of difference or wisdom (and acting) in that. There is a majesty or a sanctity in the photographs of A. Lincoln. The circumstances in which stills were shot in those days—the need for stillness and duration, and a deep summoning of self—may have affected that. Or it could have been the tragedy Lincoln understood. The danger facing this film, and something I rather dreaded in advance, was that it would be a beatification, hallowed, saintly and as full of that white light of history and awe that Steven has always loved, whether pouring it on people in concentration camps or E.T. That peril has been avoided. Day-Lewis plays the part of a devout politician, a man who often hides from his own nobility in the delighted air of masquerade, storyteller and poker-player. That is the real lesson for now, in these few days. Being a nobleman or a saint is not enough in a leader. We need someone who can stoop to getting the job done, and wheedling the necessary votes in any way it takes. 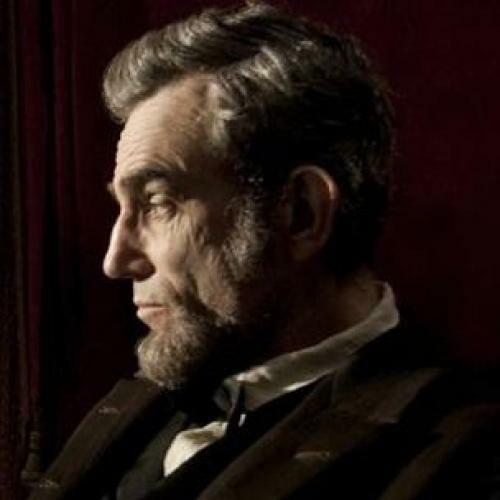 Lincoln the movie may look archaic and nostalgic in time—even in quite a short time. But for a few days or weeks now, it is the moment in a way few modern movies have managed. It’s very good, but that’s not the point. It’s necessary. Make sure your children take you to see it.